It’s hard to get children to play outside away from their electronic devices. It helps if you have fun activities for them. We have posts that will touch on the importance of play-based learning as well as the importance of unstructured play in early childhood development. While you may understand that it’s vital to your child’s health to get them outside, it can be very hard to interest them in backyard games. Our article titled Great Outdoor Game Ideas for Kids. These are activities that we play together as children ourselves. 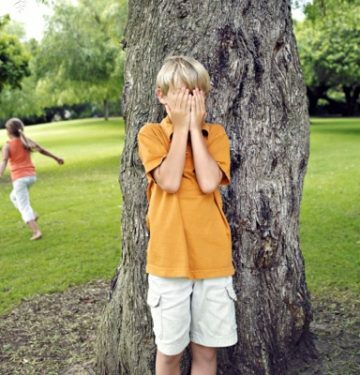 Games like Hide and Seek, Four Square, and Capture the Flag are easy to teach your kids. You can share moments of remembering with your child, too. Explain how you and your friends or siblings would play outside together. The games and the memories will help you bond. If that seems boring for you as well as the kids, you can find instructional posts on how to create wooden crafts. There are also review articles on games like the Jumbo 4 Score. It’s like a huge game of Connect4 that can be played outside. Oversized games like Giant Timbers are fun, too. We’ve even broken down a favorite from childhood, Hide and Seek, and explained the history and rules behind it. It’s vital that your kids get outside for physical activity, but they need your help to do it.